The Resistive Pedal Exerciser Stationary Bike is an economic exercise bike so compact that it stores out of the way under a chair or bed. Appropriate for upper or lower extremities. 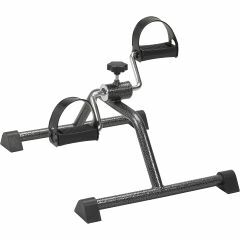 Use this portable pedal exerciser regularly to increase strength and improve coordination as well as circulation. The Resistive Pedal Exerciser is great for cardiovascular fitness! There is an adjustable resistance knob to customize each user's difficulty level. The Chrome plated steel frame construction ensures durability. The plastic pedals on the Resistive Pedal Exerciser features straps for a secure foot hold during your workout. The product was good as expected.. Comfortable. Smooth Operation. Easy To Setup. Stable. Quiet Operation. Easy To Adjust. Easy To Use. Physical Therapy. Heart Rate Training. Low Impact Exercise. Easy To Setup. Easy To Adjust. Smooth Operation. Comfortable. Easy To Use. Quiet Operation. Physical Therapy. Low Impact Exercise. Good for all above . General Fitness. Stroke therapy . home physical therapy. Disabled/ re-conditioning. Rarely Workout. Motherâs stroke therapy . Easy To Setup. Smooth Operation. Quiet Operation. Easy To Use. Occasional Exerciser. Weekend Warrior. home physical therapy. I bought this item to use while traveling in our RV. My legs are to short for the tall seats, and fall asleep from dangling. With this product I can pedal while traveling it keeps the blood pumping and gives me a place to rest my feet as well. Easy To Adjust. Comfortable. Quiet Operation. Smooth Operation. Easy To Use. Easy To Setup. Stable. high quality - much better than the professional one used at rehab -- my mom had a stroke and when in-home rehab was done we had to purchase our own -- this product is much higher quality than they used! Quiet Operation. Smooth Operation. Easy To Setup. I am recovering from a serious illness. This exerciser is helping me get back some of the strength I have lost. I use it every single day. Love it! I purchased this pedal exerciser a dozen years ago for a friend who was rehabbing. I now use it occasionally, but it makes a dreadful sound, How can I lubricate it? my hubby has had all toes amputated on one foot and cannot put his foot in the pedal any suggestions?? How wide is the resistive exercise peddler? dO you have handles for this? no handles, sit or recline and pedal away. can use watching tv or doing crafts, reading, etc.